16. 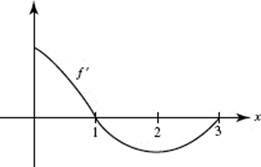 For which curve shown below are both f ′ and f ″ negative? 17. 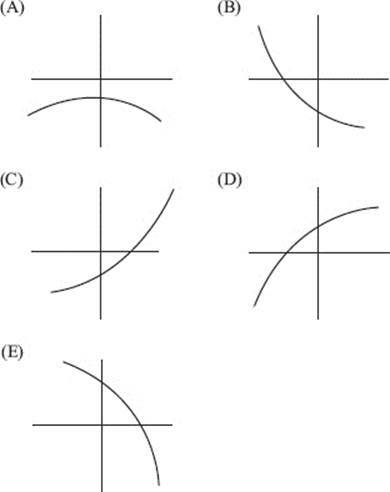 For which curve shown in question 16 is f ″ positive but f ′ negative? In Questions 18–21, the position of a particle moving along a straight line is given by s = t3 − 6t2 + 12t − 8. 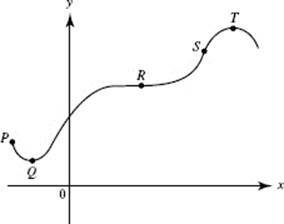 In Questions 22–24, a particle moves along a horizontal line and its position at time t is s = t4 − 6t3 + 12t2 + 3. In Questions 27–30, is the (position) vector from the origin to a moving point P(x, y) at time t.
41. A function f has a derivative for each x such that |x| < 2 and has a local minimum at (2, −5). Which statement below must be true? (A) f ′(2) = 0. 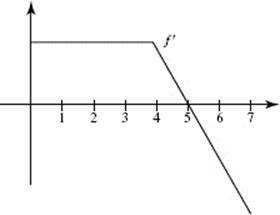 (B) f ′ exists at x = 2. (C) The graph is concave up at x = 2. (D) f ′(x) < 0 if x < 2, f ′(x) > 0 if x > 2. (E) None of the preceding is necessarily true. 45. 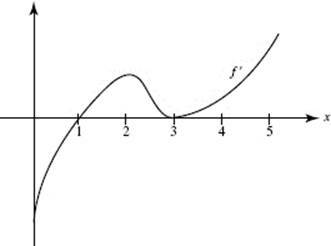 A function f is continuous and differentiable on the interval [0,4], where f ′ is positive but f ″ is negative. Which table could represent points on f ? 53. The table shows the velocity at time t of an object moving along a line. Estimate the acceleration (in ft/sec2) at t = 6 sec. 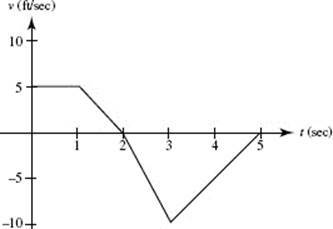 Use the graph shown, sketched on [0, 7], for Questions 54–56. 55. Which statement best describes f at x = 5? (A) f has a root. (B) f has a maximum. (C) f has a minimum. 56. 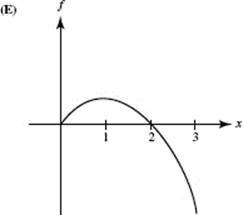 For which interval is the graph of f concave downward? Use the graph shown for Questions 57–63. It shows the velocity of an object moving along a straight line during the time interval 0 ≤ t ≤ 5. 60. How many times on 0 < t < 5 is the object’s acceleration undefined? For Questions 67 and 68, f ′(x) = x sin x − cos x for 0 < x < 4. In Questions 69–72, the motion of a particle in a plane is given by the pair of equations x = 2t and y = 4t − t2. 75. At that point, find the rate of change (in units per second) of the particle’s distance from the origin. 76. At that point, what is the horizontal component of the particle’s velocity? 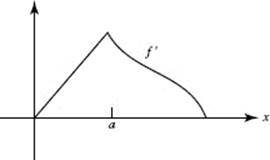 Use the graph of f ′ on [0,5], shown below, for Questions 77 and 78. The graph for Questions 84 and 85 shows the velocity of an object moving along a straight line during the time interval 0 ≤ t ≤ 12. 84. For what t does this object attain its maximum acceleration? 87. 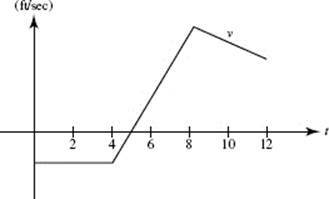 Given f ′ as graphed, which could be the graph of f ? 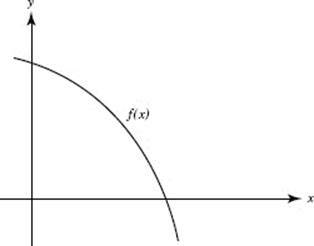 Use the following graph for Questions 88–90. 88. 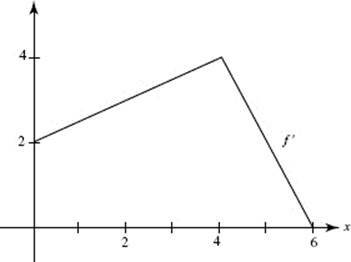 At which labeled point do both equal zero? 89. At which labeled point is positive and equal to zero? 90. At which labeled point is equal to zero and negative? 91. If f (6) = 30 and estimate f (6.02) using the line tangent to f at x = 6.